A 1955 experiment attempted to prove that spiders could be used to diagnose schizophrenia. Although upsetting for everyone involved, the experiment was even less pleasant for the spiders than it was for the humans. 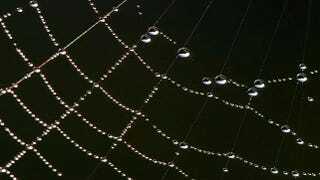 It began when scientists at the Friedmatt Sanatorium and Nursing Home in Switzerland wondered what else might affect a spider's web-building abilities. They had noticed that patients with untreated schizophrenia had a particular smell to their sweat and urine, and thought that spiders might be affected by the products put out by a schizophrenic's body biochemistry. To test this theory, the researchers took patients off their medications, and waited until they were hallucinating. The researchers collected urine from the patients and concentrated it until it was mostly solids. Re-moistening it with sugar water, they fed it to spiders, and observed what webs the spiders made. Just to make things perfectly controlled, other spiders were fed the researcher's urine. Spiders being fed urine spun slightly different webs than spiders that hadn't been fed urine (they don't precisely describe the differences, but I'm guessing that the urine webs were dispirited-looking). However, there was no difference between spiders that had been fed urine from schizophrenic patients and spiders that had been fed urine from the researchers. One thing that all the researchers noticed was that the spiders, after being fed urine, left the web, scrubbed their various mouth parts clean, and refused to drink any more of the stuff. So if you want to keep your stuff safe from spiders, pee on it. It's hardly that much of a sacrifice.